Are you in need of new gutters and downspouts? Feel free to call your local Colorado Springs roofing contractor at Go2 Contracting LLC and setup a free consultation for an affordable gutter installation. Our experienced estimators will provide you with a complete solution to your gutter needs along with one or more price quotes. In certain situations, the estimator can break down the cost into multiple prices for each service you request. Our estimators can provide you with the estimate even when you are not available, as all of our work is on the exterior of the home. Simply provide Go2 Contracting with the nature of your problem and any preferences you may have at the time of your request, and we will promptly provide you with an estimate to be left at your mailbox or front door. Upon receiving your estimate for your gutter replacement, feel free to call back to speak with your estimator regarding the details of your possible service. 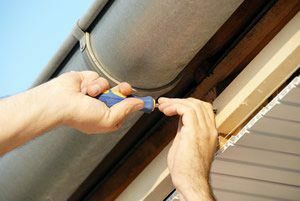 At Go2 Contracting LLC we have full time roof repair crews available for commercial and residential repair work, so you can rest assured someone will be able to take care of your gutters professionally and efficiently. We strive for efficient project completions that are done on time, on budget and according to our client’s specifications. Call today to request your free gutter system estimate and consultation. As a professional Colorado Springs roofing contractor and gutters expert, we look forward to serving you at Go2 Contracting LLC, whether you are looking for gutters in Colorado!